Russia's most beautiful philanthropist, who is expecting her fourth child, is working extra time to put happy smiles on children's faces. On Universal Children's Day, Natalia Vodianova together with her Naked Heart Charitable Foundation introduced a free mobile application – "Donate a Smile". This application allows people to make a donation of 10 rubles ($0.3), and share their, their friend's, colleague's or evenbeloved dog's smile, and also to see, on an improvised map, all those who havealready joined the campaign worldwide. The application is available in the Apple Store and Google Play fordownload onto all iOS and Android-based devices as of November 20, 2013. The money comes not from user's account, but from the sponsor of the application. The model has promised that the sponsor will not stop this promotion if it becomes a great success among smartphone owners. All this money will be used to support the basic programs of the Naked Heart Foundation, which has been operating since 2004 – such as the construction of playgrounds and the training program for teachers to work with children with autism, at the mention of whom, the eyes of the beautiful philanthropist start welling up with tears. By the way, in November Vodianova opened 100 playgrounds in Russia, built on money from benefactors. The organizers arranged the presentation of the project in the style of the Mad Tea Party from Lewis Carroll's Alice in Wonderland, with huge cups, English muffins and a huge pudding. 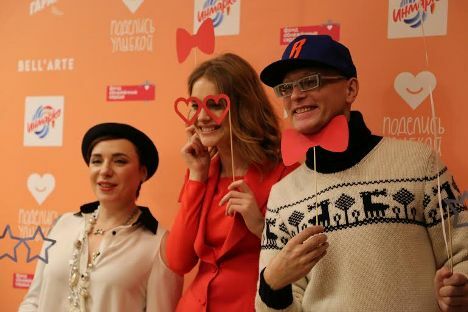 And before that, a number of Russian stars, including Andrey Malakhov and Kseniya Sobchak, headed by the Vodianova herself, dressed in bright red suits, drove through Moscow in a double decker bus with bright beards and glasses calling on everyone to take part in the fun, and to have their pictures taken. According to Natalia Vodianova, she has long wanted to come up with aproject in which people can help children, but not giving money directly. "I am confident that with the development of information technology and social networks, everyone can do good deeds today, regardless of their status, wealth and age. The most valuable things are the goodwill and the desire to help. When I thought about how a kind smile of a happy man, can benefit those who need help, a line from the song "Share your smile, and it will return to you more than once" occurred to me. Thus the idea of the project "Share a Smile" was born. So grab your smartphone, make a selfie, decorating it with an animated mustache, glasses, butterflies, and upload it into the application – and, perhaps, your smile will change someone's life," - urges Vodianova. You can trace the expanding map of smiles, and the amount of money raised,on the official website of the application – donateasmile.nakedheart.org starting on November 20.